Leading Exporter of hot tiffin for tiffin service from Vasai. With an aim to stand high on the expectations of customers, we are engaged in manufacturing, supplying and exporting Hot Tiffin for Tiffin Service. Remaining in-tune with the changing trends of the industry, these tiffins are manufactured by us. 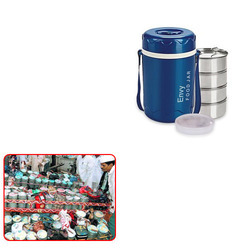 Furthermore, we provide these tiffin boxes in variegated shapes, eye-catching colors and different sizes.